Isle at Watercrest Mansfield offers a full range of health care services all under one roof including assisted living, memory care and extended care. 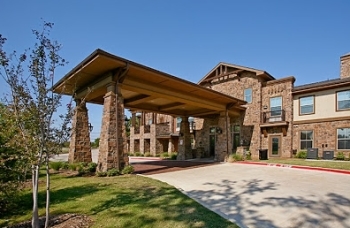 Isle at Watercrest Mansfield is managed by Integrated Senior Living. Glorious sunny apartments, customized levels of care, at-your-service amenities, a way of life designed for your pleasure. Once you experience the resort lifestyle of Isle at Watercrest Mansfield, TX, you’ll never want to leave. And you won’t have to, even if your health care needs change. Our month-to-month rental agreements give you access to every level of care. You’ll see an amazing difference in the warmth and elegance of our health care neighborhoods. Settle into the luxury and comfort of our spacious apartments with nine-foot ceilings, deluxe appointments and crown molding. You'll feel right at home. At our beautifully designed community – on the campus of the new, resort-style active adult community, Watercrest at Mansfield – our residents enjoy the comforts of home in a private, well-appointed apartment unique to their lifestyle, yet providing the 24-hour care and hospitality that suits their individual needs. At Isle at Watercrest Mansfield, assistance with daily living and first-class amenities combine to create an inspired and comfortable place to call home – a place where families are assured of the safety, well-being, and dignity of their loved ones in a charming and elegant home-like setting. Residents also enjoy the comforts of home with the peace of mind that comes with 24-hour staffing and families are assured of safety, comfort and dignity in a charming and elegant home-like setting for their loved one. Our Memory Support community, The Springs, offers the latest therapies and best practices in memory care today. The Springs has 43 private rooms, some with shared bathrooms. The décor includes high ceilings, crown molding and stylish window treatments. Our dining room, activity room and tv/social rooms are intimate, cozy and well supervised care. Residents enjoy a secure courtyard for fresh air and tranquility. With 24-hour care, The Springs offers diligent attention to each resident’s unique needs. But our whole staff has special training for the many behavioral situations that arise in dementia care: sundowning or combativeness, restlessness or wandering … They’re trained to recognize problems and apply appropriate strategies to help. Our approach focuses on non-drug intervention: using programs and staff interaction to achieve calmness and contentment. The Isle at Watercrest Mansfield offers a unique Assisted Living support program not often found in other senior living communities. It’s called Extended Care, and it provides extra support for those who don’t qualify for skilled nursing care and prefer a more residential setting in which to optimize their quality of life. At the Isle at Watercrest, we are extending your loved one’s opportunity for peace of mind, comfort and safety. If you or someone you love could use a helping hand, call us today toll free at (888) 714-6257 to learn more about Isle at Watercrest Mansfield, or complete our Request for Information form below.